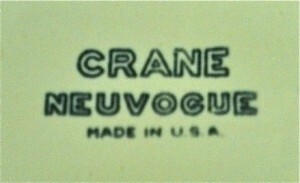 Crane Neuvogue bath fixtures - WOW ! 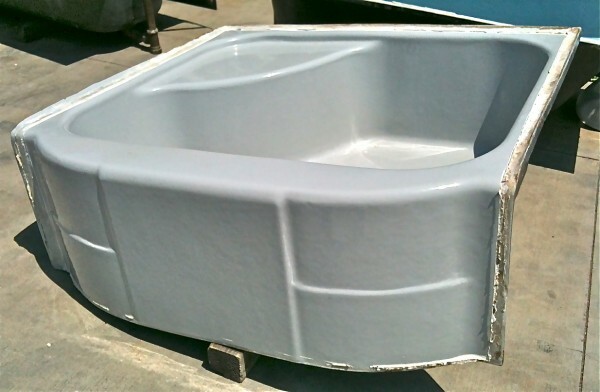 Neuvogue Receptor bathtub in grey. 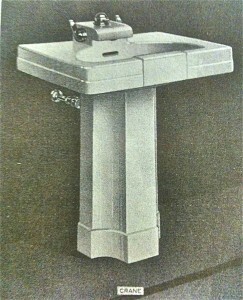 I have become interested in vintage bathroom fixtures that are not from the Victorian era. In fact, I have had an interest in mid-century accessories made by the Hall-Mack company of Los Angeles for quite a while, and I sell a lot of those accessories from my website. But, now the very unique Streamline Moderne fixtures designed by the most noted industrial designer of the era, Henry Dreyfuss have tickled my fancy. 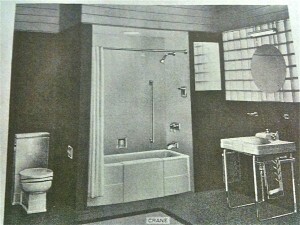 Mr. Dreyfuss, (1904-1972) was commissioned by the Crane Plumbing Co to design a line of bath fixtures and fittings that was called Neuvogue, and made its debut in 1936. 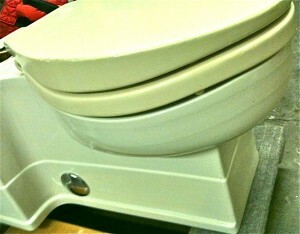 There are several distinctive design characteristics of the Neuvogue toilet that make it so unique. It was exceptionally quiet because the tank bolts directly to the bowl, which is encased inside an integral china outer shell. The water rushing through the bowl is muffled by the encasement of the bowl. The elongated basin with very large water surface. The basin rim is sunken towards the rear with a correct posture full saddle shaped seat "which won the praise of medical authorities". And finally the clean tall vertical all of one piece appearance of the basin and tank that was considered "ultra modern" in the mid 1930s. 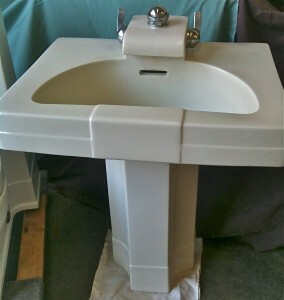 The pedestal sink is a large 27" x 22" size with a unique 1/2 round shaped bowl that leaves lots of space in the back corners to set toiletries. 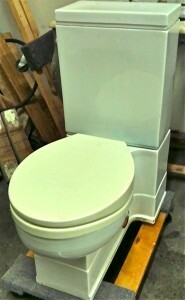 The raised china waterfall hood behind the basin contains the spout and valves are all in one place for ease of use. The handles on the sink, as well as all handles in the Neuvogue line were sleek lever and ovoid shapes and all chrome plated, called "Futura". The column is a modern design that mimics that the shape of the toilet, making a "complete bathroom of harmonious modern beauty."